After working for Christian Dior and Balenciaga in Paris Anaïs Guery moved to London and New York. This young French designer then returned to Paris for Cacharel and in 2014 created her own maison to combine heritage of Couture and crafts. Indigo blue is her signature colour. 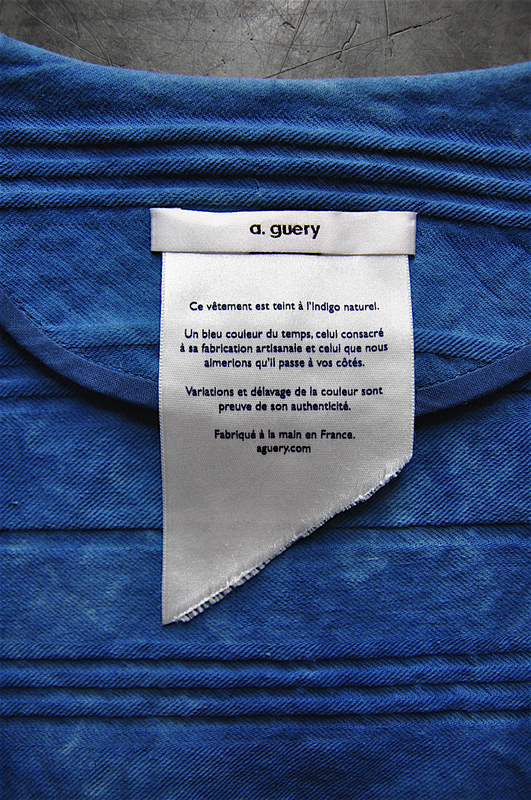 To discover why Guery is so fascinated by Indigo, I met her in her atelier in Paris. How would you describe yourself as an artist/a fashion designer/an artisan …? I would say I am dedicated to textile experimentation. Shape-wise, I identify myself as a couturier who is evolving between craftsmanship and design, what is to say between tradition and creation. Surface-wise, I have developed my Indigo dyeing process almost as a painter who would research on emotions provoked by color, shades and textures, a result that would speak to our inner feeling of beauty.. Finally , I often consider myself as a decorator willing to create a whole atmosphere by my design practice. How did your background in fashion design influenced you for this adventure ? My first approach of fashion was through art and traditional garments and crafts. I spent a lot of time in libraries to gather ideas of details, shapes, fabrics, colors. I have always been considering fashion as an intangible core around what different mediums are gravitating to build an idea, an impression. As far as I remember, I have always thought of garments in a very abstract and poetic way, not really link to a present or a future, but much more to an immutable patrimony. Couture speaks to my rational quest for epure. For me Fashion is the art of combining textile with body structure and very soul : proportions, lines and movement become a dancing and incarnated composition. What fascinates you about indigo? Indigo is a pigment born from a vegetal process : both nature and humanity are involved in its essence. It is said that you can get up to 40 something different shades, so the color becomes alive, bringing light or darkness, faded or bright. With the same gestures, the same vat, and the same textile, you will never get the same blue..
Back to my studies, Photography was fascinating to me. The power of time and light and the alchemy of print was a kind of ceremony. Younger I had also been taught raku ceramic, where fire, water and wood were key variables. Designing hand in hand with the elements and accepting to partly loose control is what drives me to experiment with the indigo dye which is so much linked to the atmosphere – air, water, temperature, humidity are calling the tune. Do you associate any symbol with blue? Blue is a kind of base to me. In my designs, even before starting working with natural indigo,I have always used blue in many shades.. It has always been evocative of origins to me. Between sky and sea, air and water, linked to vital elements again and so probably a symbol of pure and absolute beauty. Is the impact of your work on society something you are concerned about? I started working on my own project because I was not feeling concerned about the way classical fashion system works. Creating something new that kind of erases what you just achieved before is not stimulating to me. What I am moved by is much more time proof and universal. Things that last longer takes longer to create and produce, so you have to get yourself into a new logic. My inspirations are also kind of immutable. They evolve quietly, in the details. Can you tell a little about the design process, how do you start your design ? To this shapes, I associate, like an exquisite corpse, images of art pieces, interior design, places I visited, in which I find an atmosphere and inspiring techniques. So i would say I work by collage, creating a perpetual mix between my very first loves in terms of shapes and my very present appetite for textiles and surfaces all around me. It comes from out of the fashion sphere. You started to do workshops in your atelier in Paris, in Marseille to introduce Indigo .. can you explain me more why you started this? Working with this technique since a few years now, I have been getting more and more precise about the process. Explaining again and again the origins of my blue, I noticed how curious people were. I day, I realized this moment of sharing could be deeper, and I wanted to offer a kind of immersion to people..
One thing I wanted for the workshop is to offer a high-level of explanation and experimentation, so to have time and space to really feel the process in its diversity. After workshops, I always ask for feedbacks : what comes out first is the magic people felt from playing around with this ancient technique and the feeling of spending time together as a real gift. Recently, you did many collab with Meghan Shimek or l’Atelier Singulier is it something you want to pursue? Collaboration with Meghan was a very unique moment as we had a one-week residency in my atelier as Meghan arrived from Oakland and we had a very short time to create something out of our two practices : weaving and indigo dyeing. It has been such a immersion and exchange moment, very rich and friendly. Recently, I worked for Romain Cole, a portrait photographer who wanted a special background for a nomad photo shoot at Festival de Cannes. The results were beyond my expectations ! Finally, last year residency at Living Blue cooperative in Bangladesh, working with quilting masters and indigo dyers led me to understand new possibilities on how renewing traditions in endless possibilities. These kind of four-handed works are pure energy and a way to explore new territories. I do believe it gives new inputs to both parties. How do you see yourself and your creation in the future? I wish to keep on developing a.guery’ wardrobe to build a true vocabulary of shapes. Settling my own « classics » and continuing to experiment more an more with fabric manipulations for creating one of a kind pieces. I would love the studio to keep in mind its origin, to be part of a new generation, thinking about fashion differently: the clothes are made to last for years and to be a personal daily luxury, objects of respect and pleasure for both the consumers and the makers.